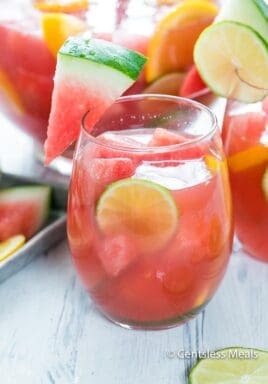 Watermelon Sangria is the perfect summer cocktail! Sweet juicy watermelon, crisp white wine and tangy citrus served with fruit is the perfect drink to enjoy on a hot summery day! 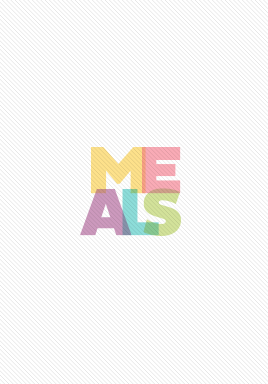 Follow CentslessMeals on Pinterest for more great tips, ideas and recipes! 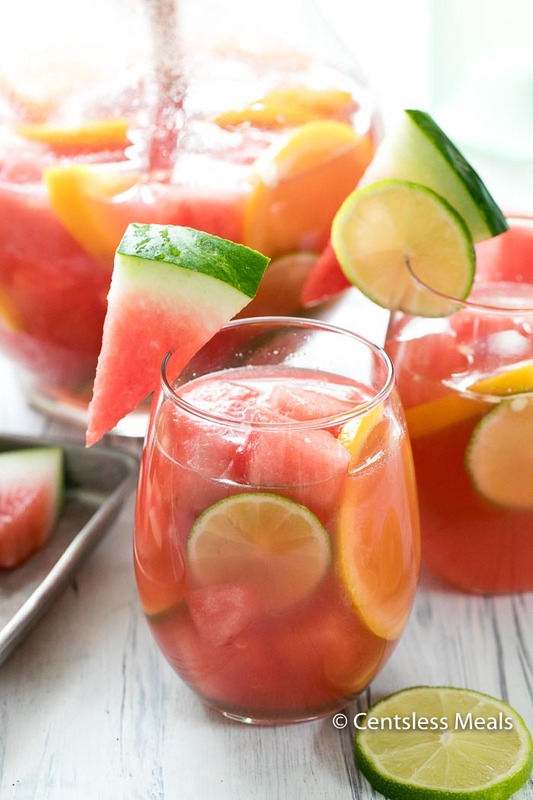 Watermelon is the epitome of summer… it’s fresh, it’s juicy, cool, refreshing and makes an amazing sangria! If you’ve never had sangria, you need to add it to your MUST TRY list! It’s the most delicious cocktail, a wine punch of sorts, loaded with fruit, wine and spirits. The original versions of Sangria (in the 1800s) were made with red wine and usually citrus fruits and it’s thought to be a play on the spanish word sangre which means blood, hence the need for red wine. 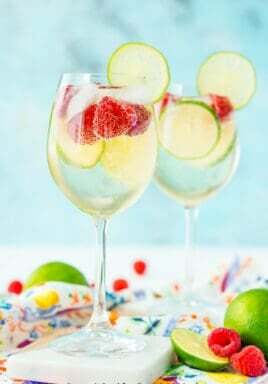 Nowadays sangria can be made with a variety of wines and fruits. The sky’s the limit really, you can go fruity with berries, tropical with pineapple, citrusy for a refreshing spin or in this case watermelon is added for a summery treat! 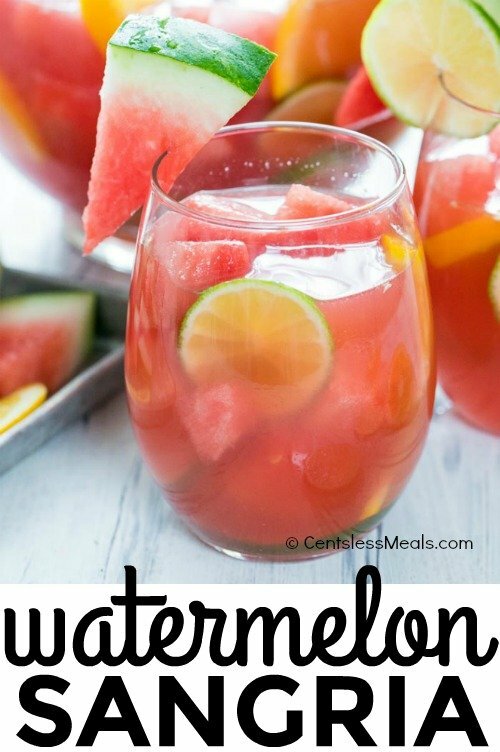 This easy Watermelon Sangria Recipe uses watermelon and citrus fruits for a delicious summery treat! 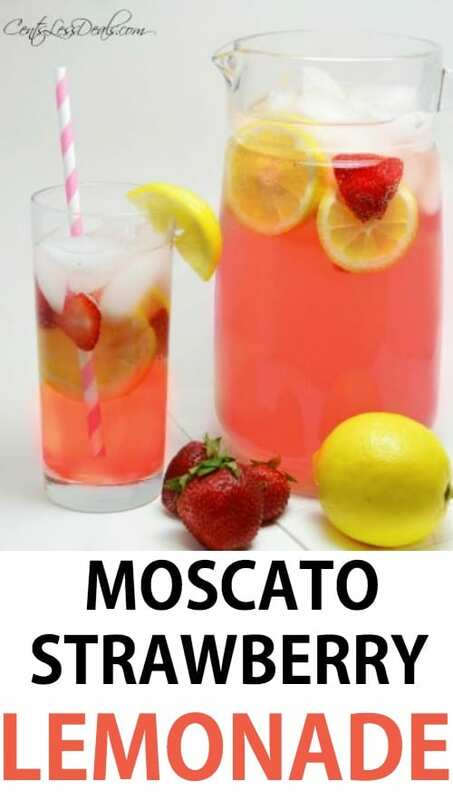 When choosing wine for this cocktail, keep in mind that sangria isn’t the place to use your favorite bottle of wine because the flavor changes with the addition of fruit and other spirits. Watermelon can vary quite a bit in sweetness so this recipe calls for optional simple syrup. I’ve made this and had it be sweet enough without adding simple syrup but I’ve also had times where I need to add plenty of syrup. I’d recommend adding the syrup just before serving; once the flavors have had a chance to blend. You’ll likely notice that the watermelon settles a bit, just give it a quick stir before serving and it’ll be perfect! To make simple syrup heat equal parts sugar and water over medium heat just until it come to a boil. Once sugar is fully dissolved, cool completely and refrigerate up to 2 weeks. When making Watermelon Sangria, you’re going to want to prepare it at least 4 hours ahead of time (overnight is best). 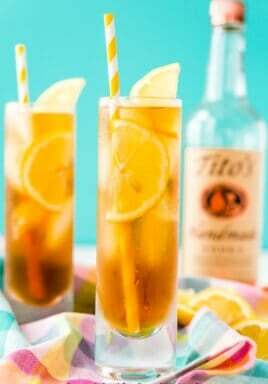 This gives the fruit time to infuse flavor throughout while the drink chills. Once it’s chilled, you can also add a little splash of bubbly (club soda, Perrier or even Prosecco) for serving. 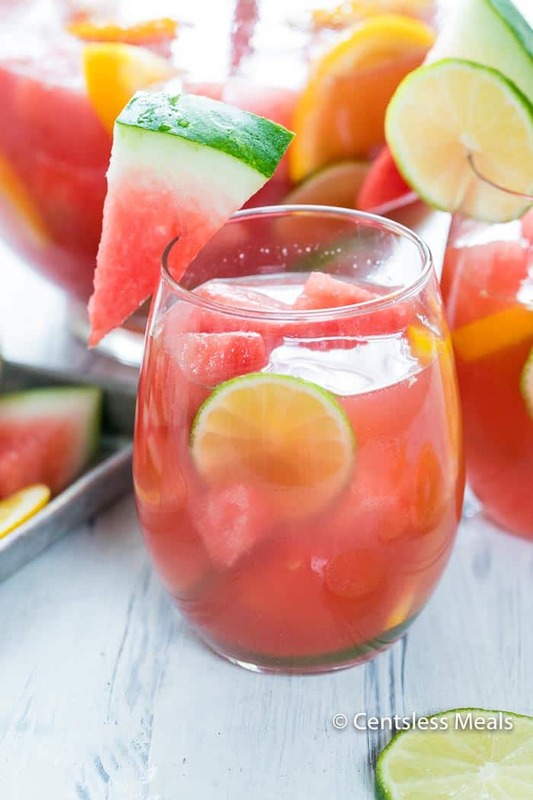 Refreshing and delicious this Watermelon Sangria is the perfect summer cocktail. Blend 8 cups of watermelon cubes in a blender until smooth. Strain through a fine mesh strainer. 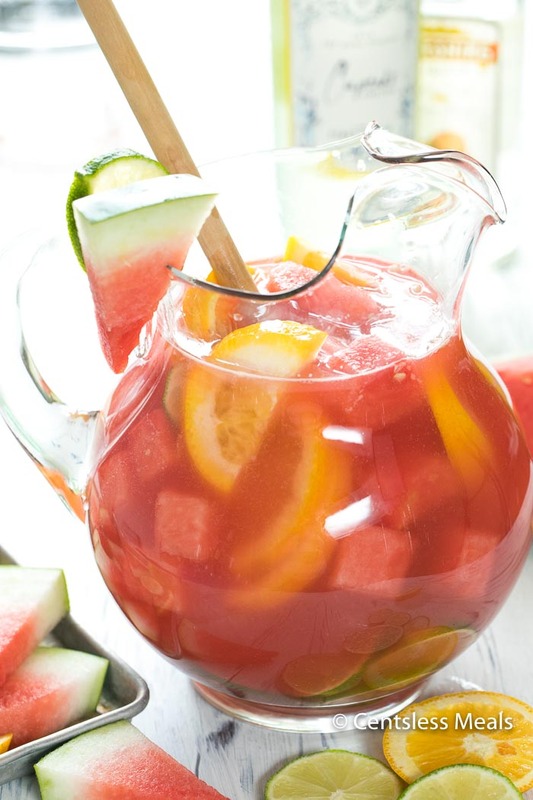 Place remaining watermelon cubes and citrus fruit in a large pitcher. 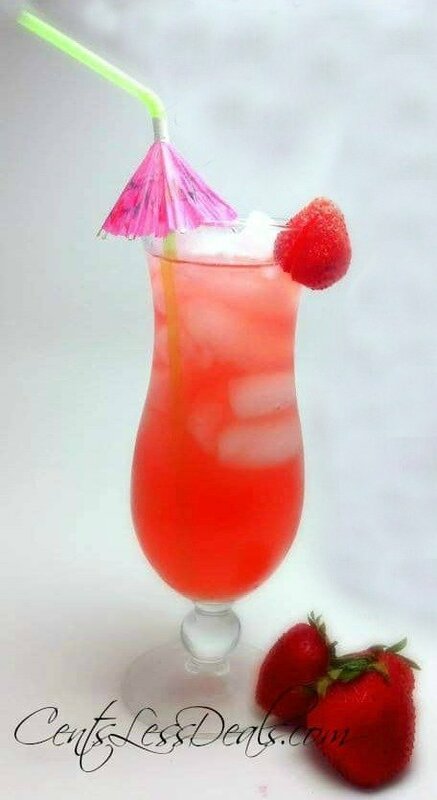 Add strained watermelon juice, wine, vodka and triple sec. Cover and refrigerate at least 4 hours or overnight. Taste before serving and add simple syrup as needed. Serve with additional club soda or prosecco to taste. Allow sangria to steep at least 4 hours before adding simple syrup. Nutritional information does not include Prosecco. You’re welcome! Glad to hear you love this recipe! !